Come to the Halifax Holly Holly! Halifax’s Library and Information Science Holiday Social is back – Join your friends and colleagues for an evening of great food, door prizes, fun, and holiday cheer at our annual Holly Jolly! Even Santa's elves need a break from cataloguing the toys. The Holly Jolly costs only $10, or $8 for students. We’ll be taking over Argyle Fine Art at its new Barrington Street location on Thursday December 8, from 6pm to 9pm. There are many door prizes to give away, and once again we’ll have excellent catering from Certainly Cinnamon. In the spirit of the season, we ask that Holly Jolly’ers bring a non-perishable food item(s) to support the Parker Street Food and Furniture Bank. The Holly Jolly is brought to you by the Halifax Library Association with the support of NSALT, APLA, other and library associations in Nova Scotia. 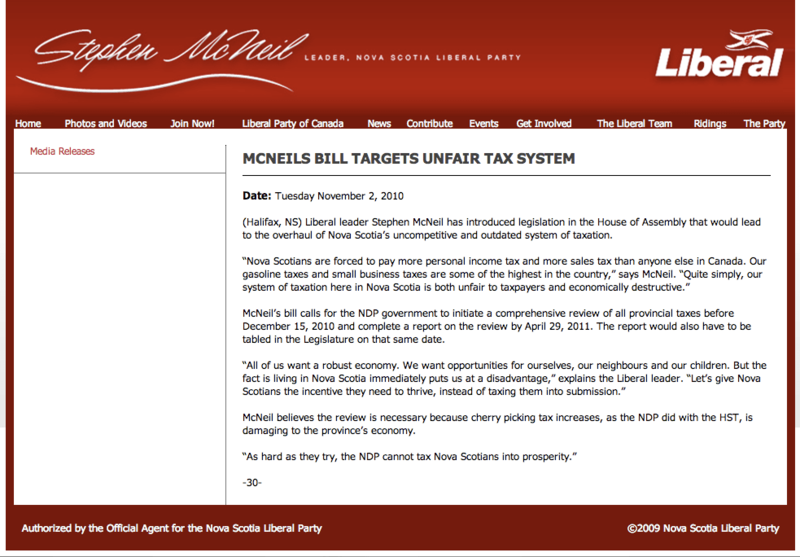 Are you coming to #CLA2011 (or #CLA11) in Halifax, Nova Scotia? Then this Google Map may come in handy. I created a Google Map to help a few librarian-friends from across Canada decide on some things to do in Halifax and then decided to share it with the world. Enjoy, contribute, and share and share alike. And since you’re coming to CLA 2011, make sure you visit and say Hi! during Saturday morning’s Technology Lightning Strikes! panel at 8:30 (Session G49). I’m going to be speaking with a bunch of excellent librarians (read: absolute tech superstars who know so much more than me!) about emerging technology trends and how to integrate them into your everyday work with little fuss and hardly any muss. I’ll post more details on this in a later post. At any rate, come say Hi, or tweet me on Twitter – I like meeting people and showing them about this town – Halifax is a great town to visit. 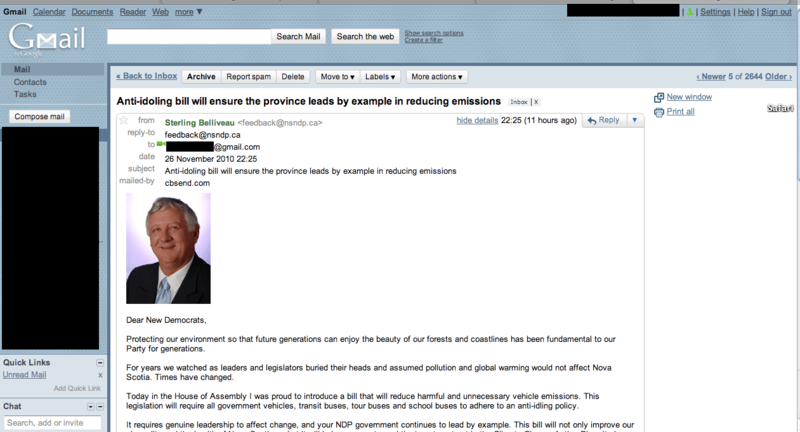 NOVA SCOTIA NDP : "Anti-idoling bill will ensure the province leads by example in reducing emissions"
This is a complete and utter homonym-FAIL on the part of my current government (who I otherwise appreciate). It’s also a great example of why you shouldn’t send out PR at the end of a long week. n.b. I’m not so much of a grammar nerd that I care to distinguish between homonyms and homophones. The gov’t still screwed up on this one. The good news is that Halifax Public Libraries has already secured the land and funding for a new downtown branch, and it has already contracted the services of two architectural firms to build a new library just across the road from the current site. The great news is that HPL and the architects have committed themselves to real civic engagement through the entire design process that will culminate in a proposed design in November 2010. Thursday’s meeting shows us that community involvement is HPL’s priority in the process. Rather than hogging a microphone and telling the public what they’d like to do with this potential space, librarians and architects turned the session over to the assembled group and asked them to answer conceptual questions like “What can the Library do for you and what can you do for the library?”. Each time a new question was raised, attendees were asked to move to a different table in order to discuss things with a new group of people. This process organically developed themes from the ground up since the public brainstormed on their own accord about what a new library needs and what a city needs in a library. In the end, the public was able to tell the architects, designers, and librarians what was important to them and what the new building will require to meet their vision. HPL rejected a top-down approach to surveying community needs and all parties came away better because of it. Although a top-down approach likely would have determined similar themes such as accessibility, sustainability, community space and learning centers, the actual process used on Thursday night reminded the community that they are the library system’s primary stakeholders. Giving the floor over to the public (I’m part of the public on this one) showed us that our input is not just desired but is formally required before the architects can go forward. It reminded us that if libraries are the civic centers that nurture the growth of communities through collections, services, and programming (and they are), then it is imperative that the community take a lead role in the design process. Halifax Public Libraries isn’t just paying lip service to community engagement on this path toward a new central library. Rather, they’re determined to have the community involved in every step along the way. Speaking as a member of the public on this issue, the meeting reminded me that community action and awareness is a real thing at the library. It’s real easy for people to think about municipal government as nothing more than the organization that clears roads in the winter and maintains parks in the summer. The library, however, is an arm of the municipality, and it’s the part of the municipality that’s in the trenches working with people and for people every day to make their lives better. What we saw at the HPL Planning meeting last Thursday was real evidence of Halifax community building by, with, and for the community itself. 2005 median income – This is not the average income for the tract but the income that separates the top half of reported incomes from the lower half of incomes in the area. This is a commonly used value when considering income because it prevents incredibly high and incredibly low incomes from affecting a stated average. married-couple families – StatCan records income for different family types. There are lone-parent families, of which “female-lone parent” and “male-lone parent” are subsets. StatCan also lists dual-parent families (my term). In these are two distinct kinds: married-couple families and common-law families. However, Statistics Canada does not combine these values for us into one field as they do with lone-parent families, so we must consider them individually. Two interesting patterns emerge on this map. The first pattern is the manner in which lower median incomes become prevalent as one moves west to east. The further into old Halifax County one drives, the lower the median income will be. Presumably, lower rural-based incomes and dual-parent families who hold only one reported income between them account for this. Note, however, that in rural western Halifax county, we nonetheless find higher incomes: the incomes over extreme western Halifax are nearly double the incomes in extreme eastern Halifax. Tract 2050004.01 (which I’ve called South End-Railyards): $36,179. These tracts, nearly side-by-side one another on the Halifax Peninsula, house two distinct populations that are tied at the hip – the student underclass studying and working at the post-secondary schools and hospitals that dot the south end, and the professional class that is employed by these institutions. I’m painting with broad strokes here, of course, but it does serve as a little bit of context to explain how these two different income levels lie within only two or three kilometres of one another.